There is no news here. This is a big action film with a giant ape that fights humans an monsters on an island. It is pretty much what you expect it to be. It is entertaining while you watch it and forgettable almost immediately. You will have enough time to consume your popcorn, but I don’t expect there to be deep conversations into the night over the nuances of the story. Samuel Jackson may be playing Captain Ahab or Colonel Kurtz, trying to win the Vietnam War after we abandon our ally, but that plotline goes no where except to create a little motivation for otherwise foolish choices by a professional. Tom Hiddleston seems to be auditioning for his role as the next James Bond by playing a SAS agent, out of service but willing to contract for a fee. He is supposed to be the hero part in the movie and he was fine, but the character is so thin that we don’t get much rooting interest. Academy Award Winner Brie Larson is on hand as a photo journalist who smells a story. It’s never clear how she got authorized to be there but that doesn’t matter. I was completely surprised that the film is set in 1973. I suppose there are story issues that are easier to sell that way but it does seem a bit disconcerting. John C. Reilly is part Rip Van Winkle and part Dennis Hopper when the expedition gets to the island. Somebody on the writing team must be a Cubs fan because that is a thing here. Anyone who has seen a King Kong movie before, knows that Kong is a double edged sword. He is as scary and dangerous as hell, but there are always other things that are more frightening and dangerous, including mankind. There is actually a subtle environmentalist message in the movie, but I doubt anyone will notice it between all the helicopter crashes and monster battles. The tribesmen on this version of the island are just as silent as the ones in the Peter Jackson film of a Dozen years ago, but they are less malevolent and apparently wise in the balance of nature. They have the role of religious shamans who convey wisdom to the modern world but do so in a silent manner. 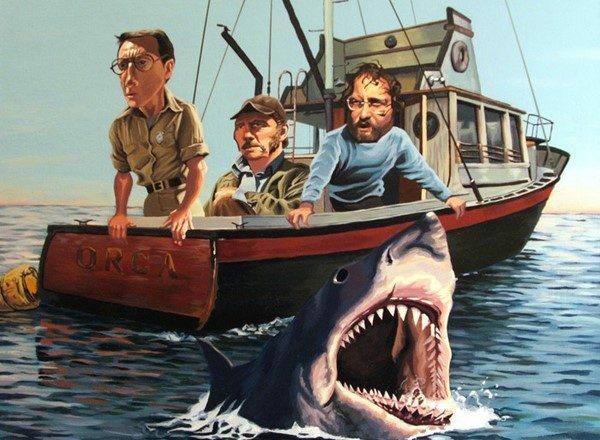 John Goodman got a star on the Hollywood Walk of Fame in conjunction with the release of this film. This is a good sized part but nothing special as far as his performance. It would have been so much more befitting if the honor had been bestowed on him last year. Samuel Jackson is a lot more subdued than he usually is, I don’t think I can remember one use by him of his favorite adjective. There was a nice call back however to his role in Jurassic Park. That was entirely fitting given the nature of this film being about giant monsters on the loose on an island. You are probably aware that there is an after the credits scene. 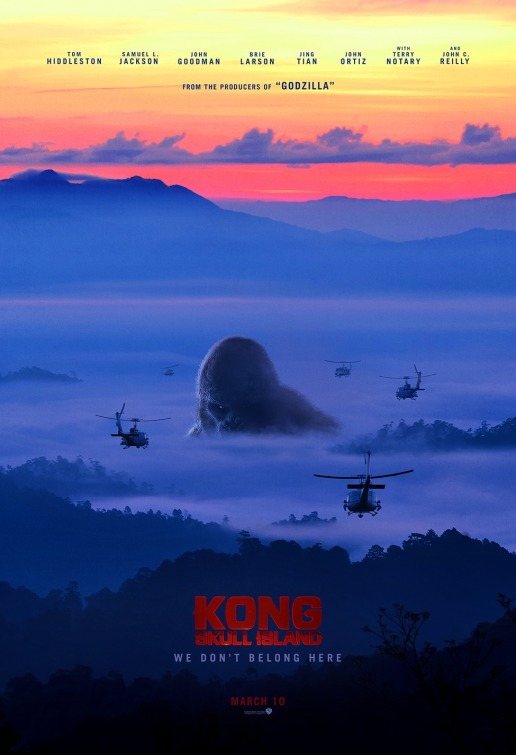 It is entirely there to set up a series of future films featuring Kong. The studios that combined to create this movie are trying to set up a cinematic universe which will support all kinds of 50s monsters being in a story. It will probably work, this movie will do business until another action film worthy of our attention shows up. Until then, check your common sense at the service counter and pass the Hot Tamales. They will go well with the butter oil in the popcorn, and they will be satisfying for about the same amount of time as this film.